The overall lay out of this DJ controller is standard, which is a good thing. We’re glad Pionner didn’t get cute with changing the location of all of our buttons, knobs and faders. They took it straight out of their CDJ and DJM equipment some of you may have seen before. 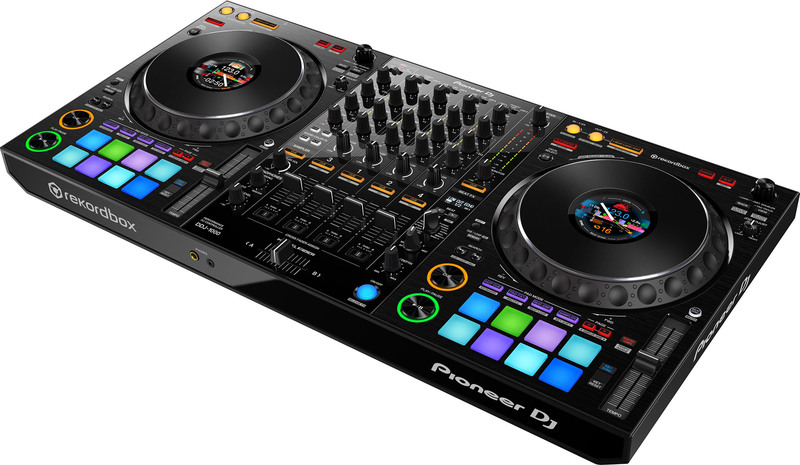 How about the build quality of the Pioneer DDJ-1000? The entire unit itself is aluminum and acrylic-finished at the top panel, and This one has brand new and “upgraded” jog wheels — a 202 mm aluminum make (yes, full size). The fader on the other hand is all new with this one as well, coined as the “MAGVEL FADER“, which technically has about 10 million movements with very little latency for great scratching here. 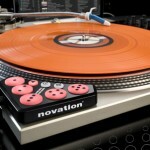 When getting our hands on it, we have zero complaints here — scratching was seamless and we definitely got into a groove. 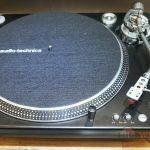 No nitpicks about this, although we never have doubts with Pioneer gear in this regard, considering it’s one of the biggest features of a DJ controller — if you can’t scratch, it’s not worth it. The performance pads do the job and are made of a higher-end rubber. They aren’t velocity or pressure sensitive or made like some other pads we love (InMusic’s brands with MPC, Rane or Roland for example), but when it comes being able to press them well to trigger some hot cues, pad FX, beat jump, sampler and more, you’ll be fine. We don’t know many DJ’s who buy controllers just for the pads, as opposed to perhaps producers who need this as a staple-point of their setup with drum machines, etc. They’re also back-lit and color assignable so you can easily remember where you’re at for some shortcuts. 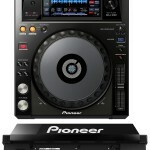 In regards to “size” of this one, Pioneer advertises it as “portable and compact”, and they’re not lying. It’s very sleek and we were able to pick it very easily at the convention, considering it weights a mere 13.2 lbs (6 kg). The dimensions in case you were curious to see if it’s compatible with your existing set up or case are 708 mm (w) x 73.4 mm (H) x 361.4 mm (D). Very slim and easily portable for you traveling DJ’s. So how’s the sound quality? Have they upgraded their sound cards to a better resolution? Short answer no, however the resolution here isn’t bad at all — it’s pretty top-notch and up there with many in this price-range. You have 24-bit and 44.1 kHz at your finger tips, with a frequency range of the perfect 20 to 20 kHz. Even if you’re a pro and recording for a major label (who actually does around these parts? ), this is feasible sound quality, so there’s nothing to worry about in this regard. 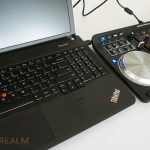 What really stands out to us is the fact that there isn’t just a LCD screen at the center (like some other popular DJ controllers that are compatible with certain ‘software’). As seen in the previous photo above, you have a separate LCD screen for literally each jog wheel, showing us crucial info for that channel, such as BPM, waveform, playback position or hot cue\loop points. As stated previously, the performance pads also give us hot cue and loop trigger capabilities as well. Let’s talk ins and outs. As in the rear photo above right here, you have the following inputs — 2 line (RCA), 2 photo/line (RCA), and of course, 2 MIC (XLR and 1/4 TRS). For outputs, there are 2 master (XLR and RCA), 1 booth (1/4″ TRS) and 2 phones (1/4″ stereo or 3.5 mm stereo mini). Lastly, there are 2 USB B ports to of course hook up to your computer or mix and match our other updated DJ controllers you may have at hand (or want to add later down the road). No, there are not MIDI ins and outs in this one, but you can always hook those up separately to your DJ laptop or computer. 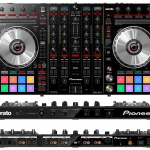 When it comes to FX, we really liked what Pioneer had added with the DDJ-1000. There are hardware effects, so we’re very happy to not have to rely on software FX here. There are four new Beat FX (called Enigma Jet, Mobius Saw, Low Cut Echo and Mobius Triangle), as well as 10 of their older FX from their previous DJM mixers (dub echo, filter, noise, pitch). 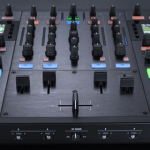 Of course, the fact that this DJ controller gives us 4 inputs is huge for flexibility. You can connect to other gear you have, such as CDJ’s, analog turntables (to use this as a standalone mixer), or perhaps other gear you want to integrate. Another few standouts we’d like to mention before concluding is their “Page” feature. You can access up to 16 hot cues and switch among 1-8 or 1-16 to trigger each in a separate track. There’s also a nifty “Key Shift” we played with that can automatically change the key of your next track to match the deck for a nice mixture of any combination of tracks based on harmony (why not?). Combine these with a few other modes they have, such as auto beat loop, beat jump slip mode, talk over function and EQ isolator, and we have a lot of versatility at our fingertips. In the box, you’re getting an AC adapter, power cord, USB cable, guide, and the Rekordbox DJ license key card. This is huge if you don’t have DJ software yet, and if you do, may be the ultimate make or break when it comes to buying the DDJ-1000. Which leads us to our conclusion. As always with the release of a new DJ controller, we have some simple questions to first ask. What DJ software is this particular controller going to be made for? The license for their “Rekordbox DJ” is big here, and they also suggest you buy (yes, pay more money) for their Rekordbox DVS — their version of being able to scratch your digital files. You can’t do it without it (it’s another $100 retail). 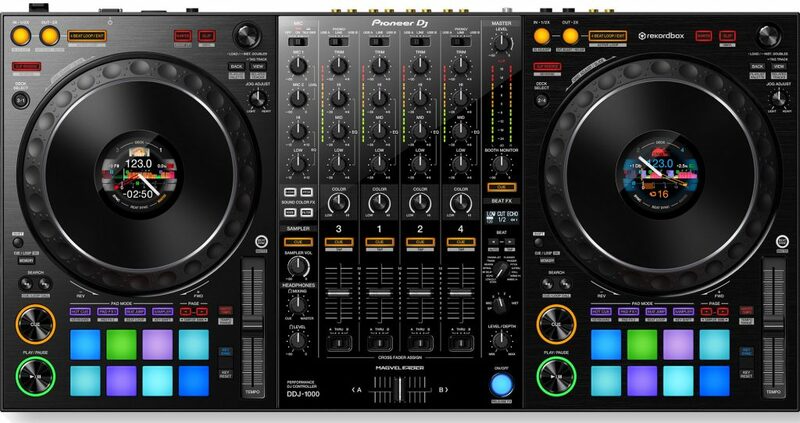 We also like to ask — is this worth upgrading over my existing DJ controller? That’ll depend on your current setup. If you already have a high-end DJ controller, there isn’t anything on this particular model that completely changes the game, aside from some of our favorite features listed previously in the jog wheel screens, very slick fader, and high quality jog wheels. If on the other hand you are a indeed an existing Rekordbox DJ user or enthusiast, this DJ controller was put out to parallel the new features they’ve added in the software’s latest update. So if you want an even better work flow with some nice shortcuts of the new version of their software, this may very well be worth upgrade — if you have the cash of course (it’s said to retail at $1100+ USD). Regardless, if you don’t actually have a DJ controller yet, or yours is way out of date, the Pioneer DDJ-1000 is a great piece of DJ machinery here. Yes, it’s definitely ‘compatible’ with Rekordbox (really not fans of making only “one software” compatible, or at least advertised as so, especially if it’s the brand’s own software they’re trying to push out there), but we feel it can work with other popular DJ software out there as well, such as Serato and even Traktor (we don’t recommend mixing and matching with Traktor — stick to N.I. gear). There are also many Pioneer controllers out there specifically made with Serato if that’s what you’re already using or want to get going on. We’re not sure why Pioneer is going really hard on pushing their Rekordbox DJ software. Maybe they’re just trying to get it out there more and by keeping options in the controller realm with all of the major software, it can perhaps diversify their line? We don’t know. You can always read our best DJ controllers guide for some more options when it comes to competitors, otherwise, we like the new look of the latest DDJ controller by Pioneer — if all of these questions we’ve answered work in your favor. What are your thoughts? Let us know in the comments.